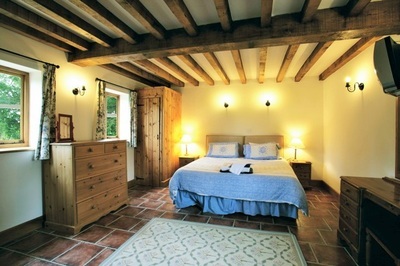 ​Quarry cottage in Mid Wales is a beautiful oak beamed cottage that is dog friendly. Fully wheelchair accessible with ground floor en-suite flexible bedroom which can be used as a super king/twin. En-suite Wet Room with additional ground floor toilet facilities. The ground floor bedroom can comfortably accommodate an additional bed. All of our additional folding beds are premium hotel standard with deep, spring interior mattresses designed for regular contract use. The open plan dining and sitting area are ground floor and adequate spacing for wheelchair users. French windows open out onto a private private balcony terrace, overlooking the trout pool and beautiful lawned gardens below. On the first floor you will find 2 double bedrooms (one can accommodate an additional bed) and one flexible bedroom room (super king/twin) that can comfortably accommodate two additional beds. All rooms are en-suite with heated towel rails. The pond is fully licensed so feel free to bring your fishing rod! Onsite we also have an array of different animals, alpacas, pygmy goats, kune kune pigs and miniature shetland ponies. Guests are welcome to explore the 8 acres of pasture land. Wifi available throughout both cottages. 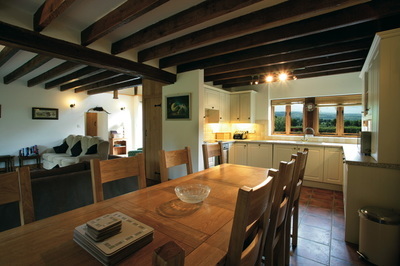 Cottages can be booked together for larger parties. 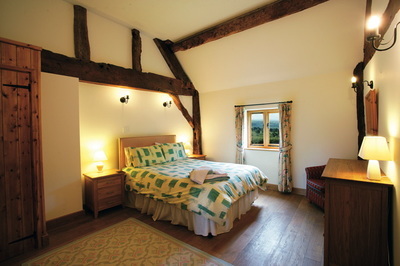 ​The quarry Cottage is perfect if you require a disabled friendly holiday cottage in Wales. The ground floor bedroom is flexible and can be used as a twin/double. Ensuite wet room and adequate space for a wheelchair to move around the ground floor. The sitting/dining area is flat and open planned.